In the not so distant past, employee approvals came in the form of a signature on a piece of paper, an email to a company admin or some other communication method not linked to the creation of their timesheet. 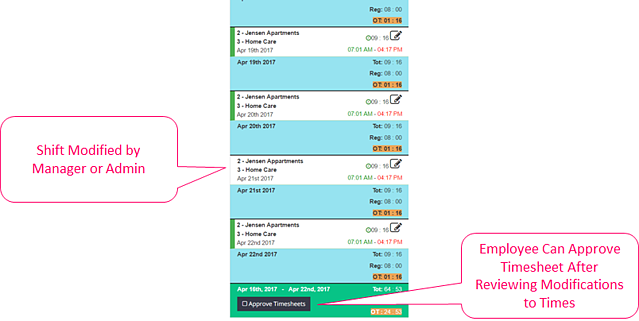 With Timesheet Mobile, timesheets for employees, along with approval of shifts, can now be reviewed within a single system. Employees can also request changes to their shifts if Timesheet Approvals is enabled in Account > Settings. 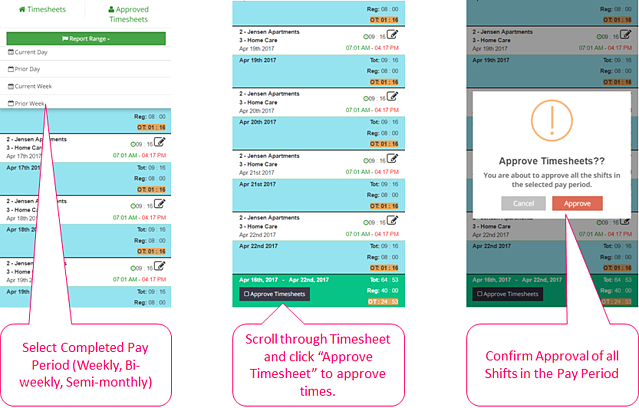 In order to approve their times for a pay period (weekly, bi-weekly or semi-monthly) employees will need to navigate to the Timesheets tab on their smartphone app while connected to the internet (either cellular data or WiFi). 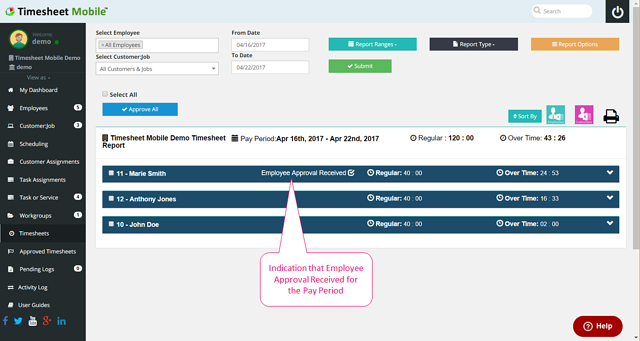 On the Timesheets tab, the employee can select either the current or prior week or pay period depending on the account settings and review the times by scrolling through their report. 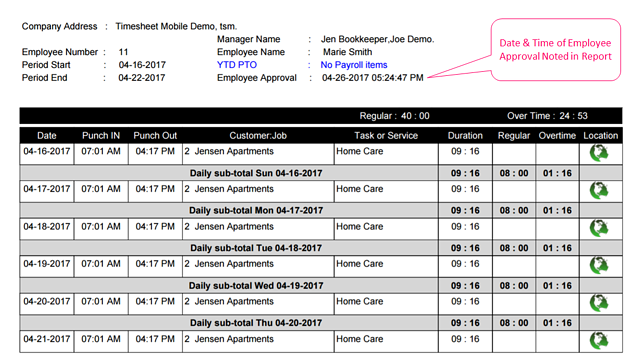 If the employee is clocked out and there are no errors or pending shift modifications in the report, the employee will see "Approve Timesheets" in the summary bar for the period selected. Clicking "Approve Timesheets" this will present the employee with a notification that they are about to approve all shifts for the pay period. By pressing approve, a record of the approval is created. 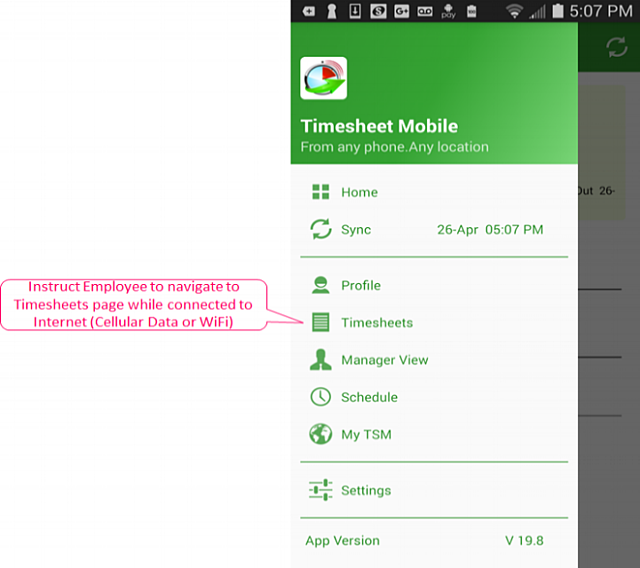 Approved shifts are marked with a green bar in the app Timesheets tab. Company administrators and managers who are running reports for a full pay period will see an indication in the Timesheet report when employees have approved their times (see below). Shifts in the approved range are also marked in green. When printing out reports, a record of the date & time the employee approval was received is indicated clearly. If changes are made to shifts in an approved pay period or new shifts are added to the timesheet report, an employee will need to review and approve the timesheet again since the prior approval was made before changes were made. Changes are visible because they will not be marked in green. It is important to note that approvals for employee timesheets can only be made for an entire pay period and not partial periods. It is also important that administrators and managers should make all changes and accept or reject all shift modification requests before asking their employees to approve times. Involving your workers in the approval process is the best way to avoid future conflicts about pay and helps to ensure compliance with an employee time tracking system. Please contact with any questions you have about this feature or others designed to improve employee compliance.